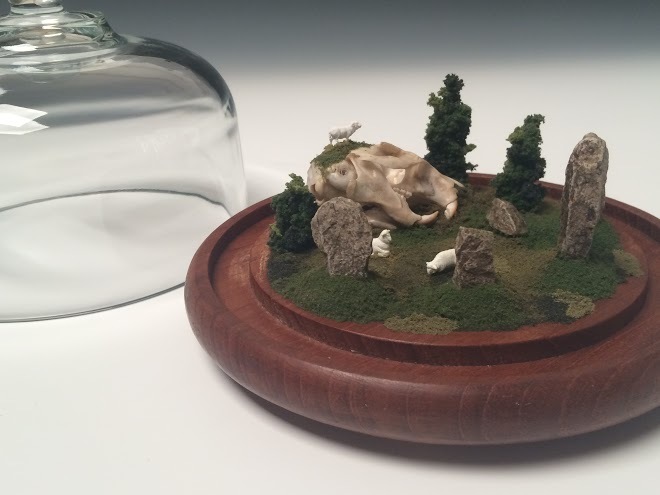 Antique glass with teak base, artificial plant material, stone, bone, railroad figurines, 7 ½” x 6”, 2015. Last Thursday evening, Ghost Gallery located in the Capitol Hill area of Seattle, Washington opened Bell Jar: A Group Exhibit, its first exhibition in a series dedicated to self-identifying women artists. Twenty-four local and national female artists were invited by independent curator and gallery owner Laurie Kearney to create their visions of a self-contained environment underneath or contained within a glass bell jar via mixed media. Patricia Sullivan: “Widget Landscape Bell Jar”. Vintage crystal-etched bell jar, chased sterling silver, patina, brass, digital photography on archival paper, Plexiglas, 6″ x 3.5″, 2015. 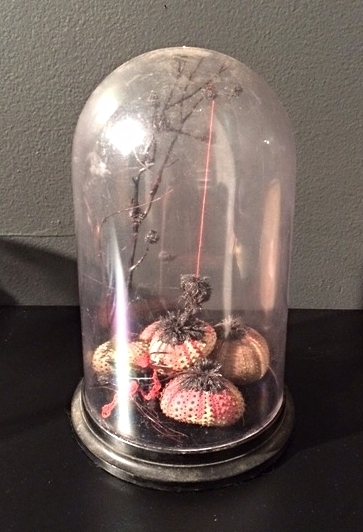 Much like Victorian-era women wore a matching set of two jewelry pieces known as a “demi-parure” – my Widget Landscape Bell Jar acts as a framing device of mixed-media. This includes landscape images that I capture digitally, output in color onto archival paper then set behind polished Plexiglas. The jewelry pieces that hold the 2-D images are hand-fabricated through chasing and repoussé metal, using primarily oxidized sterling silver, with a handmade 18-inch brass chain and clasp. The landscape which becomes the focal point of this work was captured in my travels of a late summer sunset over a marina, just before a violent storm. Using this imagery underneath the nearly-suffocating container space of the glass bell jar allows the viewer to twice-experience this digital landscape: first, as three contained pictures within blackened-silver conical bezels; secondly, as an overall vintage glass environment, set back-in-time. Nola Avienne: “Sea Building” (install view). Black coral, whip coral, magnets, iron filings, silk thread, sea urchins, distressed acrylic glass bell jar, 8” x 6” x 6”, 2015. Seattle artist Nola Avienne’s Sea Building is one of four pieces by the artist on exhibit. Both this and Avienne’s Sea Formal utilize whip coral and black coral, lending an aquatic and sea-themed experience. However, obviously removed from the maritime environment, Avienne carefully sews Sea Building‘s see-through acrylic environ together with silk thread and magnets. The vibrantly pink hues of the sea urchins create a stunning contrast to the stark black of the black coral. The distressed acrylic dome seems to beckon the viewer to think possibly that the tapering black coral as it rises up to the very top of this dome is an inanimate object’s “plea” to not be slowed from new growth, or not be forced to remain in this sheltered, stifling bell jar environment. As curator Laurie Kearney explains on the Ghost Gallery website: “This exhibit is not based on the book by Sylvia Plath “The Bell Jar,” rather it is an aesthetic exploration by these artists of the bell jar as a unique vessel to house visual art.” In addition, the gallery has set up a temporary link for online viewing of the artwork. I encourage viewers to visit this link to this exhibit, where nearly all of the Bell Jar pieces on display can be viewed and purchased through April 2nd, 2015. Bell Jar: A Group Exhibit can be seen in-person at Ghost Gallery, located at 504 E Denny Way (entrance faces Olive Way) in Seattle, WA through Thursday, April 2nd, 2015. Images used are courtesy of the artists and Ghost Gallery, Seattle. Hi Patricia….I really liked this post and enjoyed browsing thru the various bell jars. All different….al beautiful…..all clever. I too had a bell jar and would delight in creating ‘seasonal’ scenes in it. Twigs, feathers, dried blossoms, bird’s nest, coral, pebbles etc all took on a more beautiful intensity when positioned under that glass. I sold it recently….as I just couldn’t take all my ‘stuff’ to my new townhouse. A big house just won’t fit into a townhouse….but my dusting has decreased so that’s a bonus! Your exhibit was lovely Patricia….I liked the way you subtly connected it back to Victorian times….and your jewellery pieces are superb! Those colours of the storm just suit the composition….it has a stillness and is quite lovely. The positioning of the pendant is just right!! and the colour contrast….grey with brass…set in crystal is gorgeous Patricia!! A big fan and I’m tempted! Robyn, your superb comments are wonderfully flattering – and I do think Laurie, the curator of this exhibit, would revel in the fact that prior to even seeing this show ‘virtually’ – you kept items meaningful to you in a bell jar and in your home, no less. I’m so glad you understand how I’m using the ideology of Victorian safe-keeping but using the imagery of the storm to be encapsulated in this small but see-through space of the glass. Oh, I do wish I could tempt you! Just will ‘mention’ the gallery does ship world-wide. Hope you are having a lovely Saturday where you are! Dot, I’m so pleased that you think so! I am stoked to be part of this show – and I’m thrilled that you think this concept is as fab as I do. I hope all things are well for you all at Whau Studios!! Have a fantastic weekend. Thank you, Maylee! Since I see you are local to Seattle, feel free if you get a chance to drop by Ghost Gallery sometime and check out the show! Have a wonderful weekend. What an interesting range of exhibits in this show Patricia. Your piece was elegant in its crystal bell casing. In many of the works I responded to ideas of frozen time, still life and quasi-scientific curiosities. Something about being isolated under glass. Philippa, I just knew because of your painterly sensibilities you would understand (and appreciate) the context of these small “realms” each artist created under glass. And I appreciate your lovely comments re: my piece, too. While many of us seemed to react to the Victorian obsession of placing items under glass for safekeeping – you hit on something new here when you said some artists are in fact concerned w/ quasi-scientific curiosities. I hope more people that see these comments do click through to view the online-version of the exhibit. Thank you for your visit and glorious commentary today! You always open the door for us Patricia. And somehow nudge us to ponder a bit longer and more deeply! Congratulations, Patricia! Breath-taking work as always, and what a cool concept for a group show. Thanks, Gina! I think if this show had been closer geographically – you would’ve enjoyed seeing this in-person I think! Such very cool “mini-dioramas” and not like anything I tend to see over here in the Philly/NJ area. I really appreciate you stopping by today! Great concept. It made me think something that I have always believed and that is no gets enough time or opportunity to reach their potential. Some of course are given more opportunities and others are able to take opportunities but humans and in particular women are very much living under a “bell jar’. As always, a fascinating post with art that will make me ‘think things” long after the exhibition is over. Limitations, self and by others is yet another thing that connects us wee humans. Your piece was exquisite with the glimpses into the wide world and at first glance and because the piece was contained, I thought shackles. Sharon, I’m overwhelmed by your insightful comments here. Yes, I agree esp. that women do experience our lives -still – living under an encompassing glass crystal. And you also pointed out, some folks have access to many more opportunities than others. This show was a fab way for these 20+ artists to explore through making, all the wonderful points you’ve added here. I’m inspired to think that this exhibit will be thought of long after the online links come down and the physical gallery exhibition is dismantled in April. Once again, I truly appreciate you visiting my blog today! What an interesting concept, and such varied, creative and thoughtful interpretations. Lots to think about! Patricia, great choice of container/display. It works well with your pieces (“Victorian matching set”). Also, nice contrast between the warm tones of the chain and the cool greys and blues. And I appreciate that your work is always so meticulously put together: handmade chain with clasp – I find these “details” always so satisfying! The darkened silver bezel, shackle-like, framing (containing, restricting?) the images, and the hint of tension at the top of the setting, where it is connected to the bail/hook; this echoes the picture where a storm is brewing. Perfect! Dominique, please do not feel I expected you to travel that far to see my work!! Hopefully one day soon, we will be able to see each other’s artwork in-person but certainly not at an unreasonable distance! I really appreciate the feedback you’re sharing w/ me now regarding my piece – and the icing on the cake is that you ‘get’ my point of the Victorian-styled matching set of jewelry. Yes, the photography is meant to be very tightly enclosed into those dark silver bezels – and the Plexi is the final deciding element that truly traps it within. Your post has made my day! I’m so pleased you checked out the online version of the show to see all the creative work. Thanks again for stopping by and sharing your thoughtful (and articulate) commentary w/ me. Oh, but I would, Seattle is only a couple of hours away from here! Thanks, Patricia. Patricia, stunning work as always. At the risk of repeating myself, your work is spectacular in its simplicity and strength. 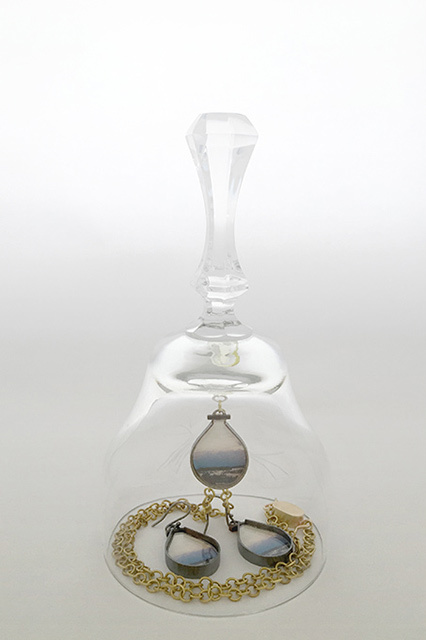 I love how you’ve repeated the “pear” shape of the bell jar in the jewelry. I enjoyed visiting the online show. Congratulations on being included in this exhibit…. I love the idea, and your work, as always, is a stand out. Anita!!! I’m so happy to hear from you!! Thank you for your really generous compliments on my piece. And very stoked that you checked out the online show! The best part really is that no two “Bell Jar” pieces look alike. I admit I seriously enjoyed stepping away from the strictly jewelry or fine craft realm and stepping my toes into the world of mixed media. With the use of the digital photography and sometimes fabric, I never felt I fit into a strict ‘jewelers’ world’. Thank you, Anita, for your visit here today and many congrats again on being awarded your latest commission. So exciting! I find it a fascinating play here, how you encapsule the ocean in huge water drops, and then encapsule those under the bell jar. It kind of makes my mind spin around this matter of being inside or outside the bell jar. Almost in a way that I can’t work my way around it. I realise there is some historical weight and context and an association of “women being locked in”. I’ll dare to challenge this view a bit: What I see here is the ocean described in its tiniest form, a drop of water. That’s a universe in itself. Being “locked in” in (f ex) a mother role, may seem limiting, but may also be the core of an entire universe, the universe that every individual being is. So, I feel that because the entire ocean/universe is there in your earrings, the bell jar doesn’t limit, doesn’t take away, doesn’t reduce, doesn’t suffocate. I think you brought the big, rich life into that tiny bell jar. And anyone can release it, within seconds. Gunilla, you are amazing!! I love your first sentence so much – how the overall shape of my jewelry pieces – or bezels – are actually huge water drops. It’s funny – because I am experimenting w/ new matching pieces that have ocean photography within, and I admit, I hadn’t realized why I had been so drawn to this “teardrop” shape. Then in this piece, everything you state about the “locking in” of the bell jar really is true; it’s not intended to be as suffocating as it could seem. I really appreciate you sharing your beautiful comments w/ me today – thanks again so much for your visit!! I’m glad to hear that what I wrote makes sense, it seems I was able to communicate my thoughts. Can’t wait to see your next piece or exhibition, anything coming up soon? What an incredible piece you have created here Patricia. It is simply beautiful. The materials and the digital images. I love it. Walter, thanks so much. I’m so happy you stopped by today! « Evolution of the Necklace: Why Is There So Much Blackened Jewelry?